Media: Soft, glossy, laminated colour covers; 21.5cm x 28cm portrait format, 80 good quality satin-finish pages. Fifteen pages containing 35 colour profiles by Richard J Caruana plus over 100 reference photographs. Advantages: Authoritative and timely monograph, on an important UK aircraft; superb collection of predominantly colour photographs; excellent colour profiles by Richard J Caruana. Having begun the series with the Shackleton, this latest title from Dalrymple & Verdun Publishing, covers that aircraft's successor in the maritime reconnaissance role (and much more), the Hawker Siddeley/BAe Nimrod. This is a timely appearance coming, as it does, whilst the present fleet of aircraft are experiencing some 'in-service difficulties' and also just as something 'Nimrod-shaped' is about to gladden the hearts of modellers everywhere (well, those in 'Braille Scale' anyway). Enough 'banter' though, lets get down to business. The book, running to 80 pages, is just under A4 in size and as usual, has soft glossy covers. On this occasion however, the distinctive 'Pop Art' style cover artwork of the proceeding titles, has been replaced by a more conventional, though no less dramatic, photograph of a Nimrod MRA.4 posed diagonally across the front. Under the covers, the text is printed on semi-gloss/satin pages, in the two-columns-per-page style we have come to expect. Apart from the very informative and detailed text which will be described presently, it is the supporting photographs which are again the highlight of this book. Those included are particularly useful, given that the vast majority of them are in colour and derived from a number of sources. These include not only the author himself (a well known modelling magazine editor and author of several other aviation titles) as well as from various RAF/Nimrod units and from the aircraft manufacturer's personnel, but also include photographs from Trevor Snowden of Hornby Hobbies Limited. The latter's inclusion will probably not come as a surprise to modellers, given the imminent release of the new Airfix Nimrod MR.1/MR.2/MR2P in 1:72 scale, as alluded to in the opening paragraph. Good photographic references for the Nimrod are somewhat limited, so this new book will find a ready audience amongst prospective modellers, providing them with more than enough detail to complete their forthcoming purchases. 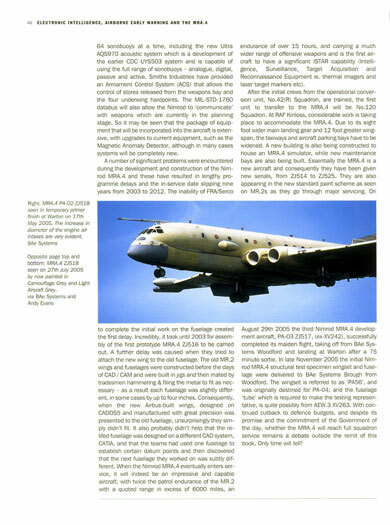 To complement the photographs, 15 pages are devoted to 35 colour side profiles and 4-view illustrations by Richard J Caruana, covering the Nimrod MR.1, R.1, MR.2/MR.2P and AEW.3 variants. On this occasion however, there are no cutaway or technical illustrations from the manuals included, nor are any scale plans provided. Whilst such omissions may be a disappointment to some, Mr. Caruana's illustrations are excellent and show an interesting variety of schemes, the diversity of which, may be a surprise to many. [Although this is not directly related to this review, modellers can also take comfort from the news that Model Alliance have a number of decal sheets for the forthcoming Airfix Nimrod in the pipeline, which (from a recent magazine preview at any rate) would seem to have been chosen in collaboration with this book, since most (all?) of them also seem to be subjects of some of Mr. Caruana's illustrations]. Turning to the book's text, this is, for a seemingly slim volume, a reasonably detailed dissertation on the Nimrod's development and service history, though by definition, some of the aircraft's operations are/were clandestine and therefore shrouded in some secrecy. Eschewing the need for a conventional 'Forward', the Nimrod's story is covered in four chapters, three appendices and a page of abbreviations and glossary. Chapter one details the birth of the Nimrod, caused by the need to replace the ageing Shackleton, focussing on the early prototypes and then the MR.1 and MR.2 variants. Chapter two looks at the changing operational needs, moving from the historic (maritime patrol and reconnaissance) to the modern (electronic intelligence gathering and airborne early warning). As such, this covers the development and service of the Nimrod R.1 (involving the RAF's 51 squadron), the abortive AEW.3 project and the Nimrod MRA.4 solution. Chapter three covers the Nimrod's wartime record, involving the Falklands, the 1991 Gulf War, Bosnia, the 2003 Gulf War and finally in Afghanistan. Chapter four rounds off the book, with details of the RAF Nimrod squadrons and overviews of their operations to date. the salient details (this is adequate, though by no means comprehensive), as well as photographs of some special squadron markings and nose art. Also in this appendix, are the aforementioned colour profile and 4-view illustrations. Nimrod's safety record and structural problems. disposition, etc. and basic technical data on the various Nimrod variants. The book concludes with an abbreviations/glossary page. As confirmed by this book's title, my dictionary alludes to the 'hunter' epithet attached to the name 'Nimrod', but as a secondary 'trait' it also mentions 'Great Sportsman'. Well, given the Nimrod's great endurance, vision, intelligence and offensive capability, I think we can assume that triathlons or heptathlons are it's sporting forte', and this book ably tells the story of a thoroughbred aircraft, born out of the Comet, able to take on all-comers. 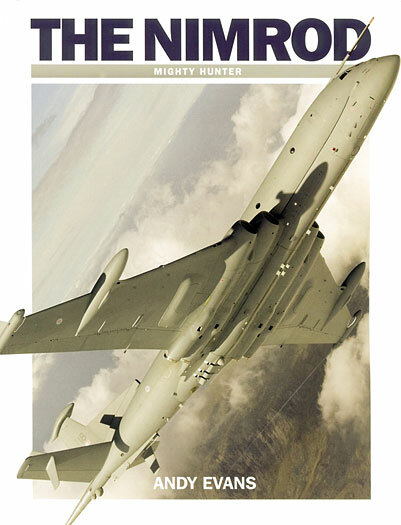 ‘The Nimrod - Mighty Hunter’ is another excellent title from Dalrymple & Verdun, and one which will appeal to many, not just those with an interest in maritime aviation. Useful photographs, coupled to an informative text containing much technical information on the various avionic, weapon and information gathering equipment fitted, make this an ideal book for those wanting to know more about this enigmatic, 'silent hunter'.